The last thing I did before my head hit the pillow last night minutes after 10 p.m. was to enter a calendar entry on my iPhone as well as an alarm reminder. You see, at precisely 8:15 in the morning my five year-old nephew would be leaving the house to embark on a whole new chapter in his young life…..full-time school….Kindergarten! It’s off to the races for my sis and brother-in-law; life will be filled with new challenges….heartaches and hassles…joy and tears….and everything else in-between. I wish them the best as their new chapter begins and I hope that my sis can breathe (calmly and level-headed) through the inevitable storms that lie ahead. If for nothing else…I hope she knows that I am here for her! So…..I was up by 5 a.m. and was sitting down to my first cup of espresso fifteen minutes later. I perused the morning paper as well as emails and the morning news on my iPad before heading out the door an hour later for a walk-jog session. I decided to go sans poodle so that I could keep up a decent pace; besides, poodle was still popped after a day out on the lake at our friend’s lake house in Winchester, Tennessee. I glanced at my watch knowing that twenty minutes are so into my walk-jog I would be making a phone call to a very important little person. As I made my way down the hill I thought about my children and their first day of school. My son started kindergarten in Pennsylvania; my daughter in eastern Oregon. My son wasn’t particularly eager to get on that big yellow school bus….my daughter was…. (more on my daughter another time). As for my son, he’d had a stint in a German preschool when he was three. In hind-sight, that proved to be not the best decision on my part. We were living in Stuttgart Germany at the time and I wanted my son to learn a second…even a third… language (he knew some Italian words at the time too). I enrolled him in the German kindergarten down the hill from our military housing with the best of intentions for my son. It was a beautiful little school and I was so excited for my son. Frau Schnied, the schools headmistress, assured me (in her excellent English) that my little boy would learn German and I truly believed the experience would be far better than the instruction he would get at the rather substandard child-care facility on the military post. It turned out that my son did not thrive in that environment and after the school year I took him out. I thought that Frau Schnied would speak German with him…she did not. I thought that he would make friends with German kids and that Frau Schnied would facilitate that….she did not. 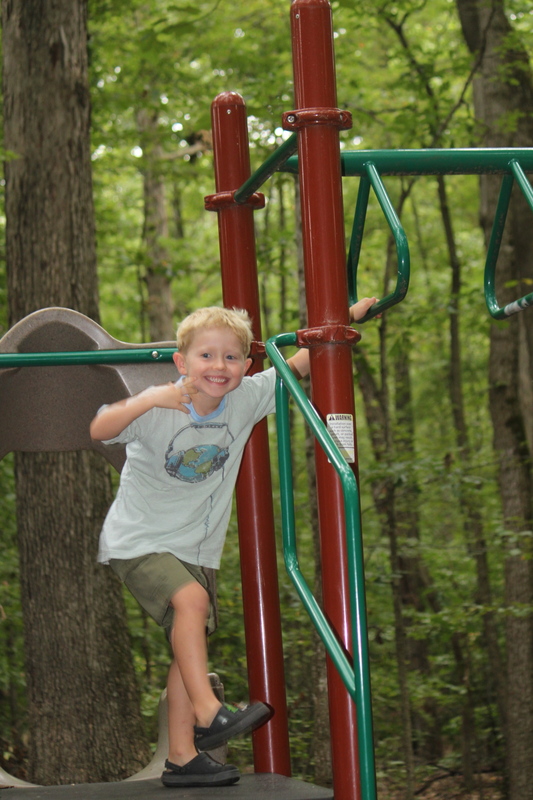 I worried for years, quite frankly, that I had screwed up my kid irreversibly by placing him in an environment that proved far more stressful for him at the time than I had ever imagined. In the end, I chalked it up to a learning experience and hoped for the best in the future. Back in the States, things seemed to go better for my son. Yes, I cried when he got on the BIG yellow school bus that first day..and the second day too! Thankfully, his public school kindergarten experience was just fine and we all liked his sweet teacher. First grade was simply OK. Then things started to go south just a tad during his second grade while we were still in Pennsylvania. Quite simply, it boiled down to two things; his age and his teacher. Being a first-time parent, I had no idea that starting him on the cut-off date for Kindergarten (based on his birth date/year) would cause a problem down the line. By the second grade my son was more towards the back of the class in terms of attention span, height and weight, as well as social skills; most of the kids in the class were a good 6-8 months older. That makes a huge difference (so I came to learn) particularly with boys. The second problem was his teacher; she clearly was not the right fit for my son. She was a foot away from retirement. Not only did she have a mean streak about her but she didn’t care about teaching anymore let alone teaching with compassion or soul. She was simply done with it all and because my son wasn’t her ideal of a perfect little student, she was both (in my admittedly biased opinion because I am the mom) harder on him and neglectful at the same time. Additionally, while I knew things weren’t right about his teacher things weren’t peachy about the school system either. I got clued in when a notice came in the mail about the standard practice of using corporal punishment for kids…in the form of a paddle. I was incredulous not to mention spitting bullets; I called the school before I had a chance to cool-off. I’m sure hot lava spewed out of my mouth as I said “over my dead body will you ever touch my son.” Fortunately we moved to a new state by the end of second grade. This provided the perfect opportunity to not only start in a new school but to repeat the second grade. To this day, I honestly don’t know how my son feels about this; he shares little with me. At the time, he seemed to take it in stride. He didn’t seem to be inordinately sad, in fact some of his artwork reflected cheerfulness. He was going to be repeating a grade in a Catholic school in Northern Virginia. Both his father and I, along with school officials, did not make the decision to repeat second grade lightly. We discussed it over and over…and I think we both, rightly so, overly obsessed about doing the right thing for our son to insure his future success. All the signs pointed to repeating the second grade to give him time to catch up with his peers. We tried to express to our son that the setback wasn’t a punishment in any way and wasn’t due to academic ability; it was just meant to allow him to catch up to his peers in terms of physical ability. 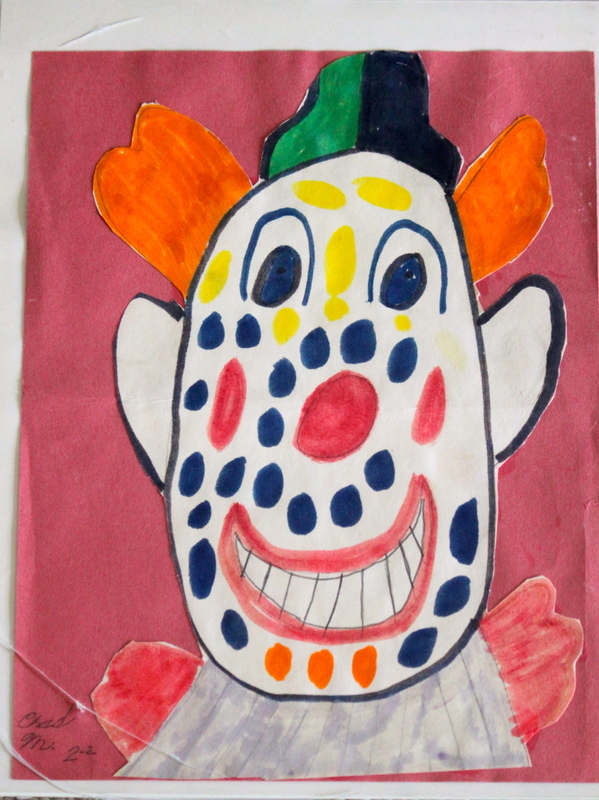 Happy Clown Art by my son, second grade. Sigh…I’ll say it a thousand times more here, I am sure…..parenting….the hardest job on the planet bar none. I looked at my watch. Time to face-time with my “monkey boy” (isn’t technology wonderful?!) I found a place to stop and called my sis. My sweet nephew was ready for my call. He was definitely styling in his new outfit, complete with new shoes. He was ready…antsy…full of nervous energy …and a big smile on his face. I wished him the best first day of school ever and told him he would learn so much cool stuff that his head might not fit through the doorway when he got home…his brain would be stuffed with new knowledge and he’d make new friends too. I spoke with sis for a few minutes telling her that new opportunities awaited for her too now that her son was off to school full-time. I know she is going to cry…buckets; if she didn’t I’d think that something was seriously wrong with her. I wish that I were there with her. I told her we could do some serious “damage” to our pocketbooks If I were living there….we’d be taking daily trips to Starbucks I’m sure…followed by shopping and spending time in parks and museums and who knows where else. No doubt my sis will find something wonderful to fill her time with; I lament that I am not closer to her so that we may do it together.